Please join us for the reception on Friday, May 2, from 6-8pm. 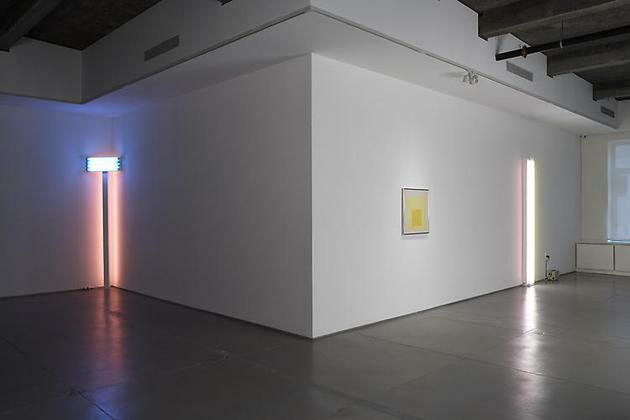 Gering & López Gallery is pleased to present an exhibition of work by Dan Flavin and Josef Albers. Pairing two highly influential artists of the 20th Century, the exhibition will allow the viewer to rediscover, evaluate and place into a new context these very diverse materializations of color and line. 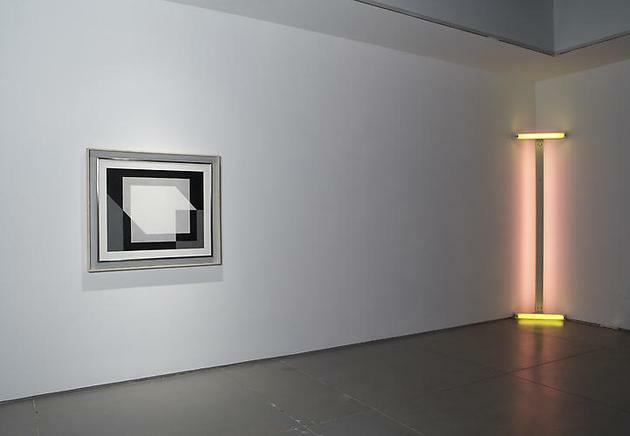 Though Albers and Flavin used vastly different approaches, both challenged the function of perception and went on to make significant contributions to the history of art. 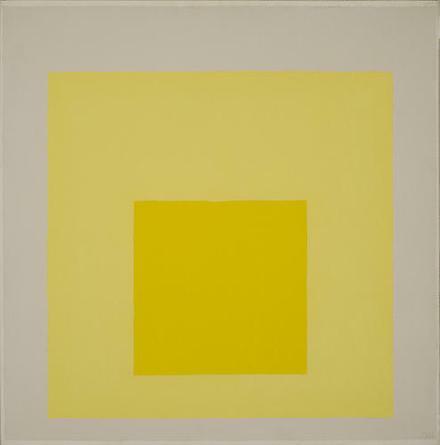 Albers, the Modernist, blurred the line between fine and applied art and employed traditional painting methods to conduct pioneering experiments in color theory and composition. 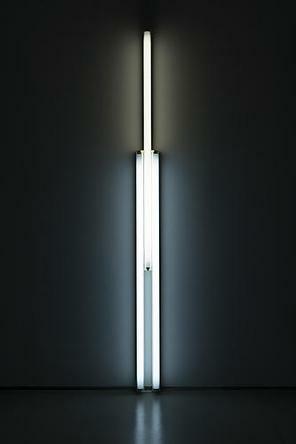 Flavin, the Conceptualist, defied convention by using commercially available fluorescent lights and placing authenticity in the viewer's mind rather than the artist's hand. Both utilized architecture and the ability of the human eye to animate their color theories. All works have been carefully chosen to give visitors the opportunity to view this exhibition with aesthetic as well as historic intentions. 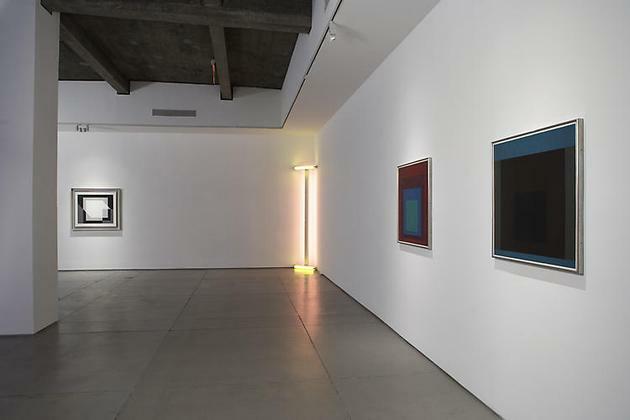 A small but comprehensive group of five oil on Masonite paintings spanning 1937 to 1971 will be on display by German-born artist Josef Albers. Several of these paintings were initially part of the Lee V. Eastman collection and were acquired directly from the artist. 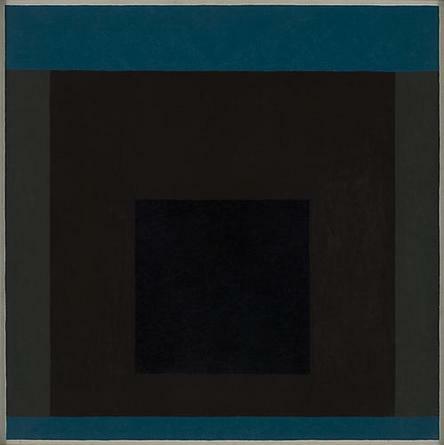 Among the paintings included in the exhibition are Composure, 1937, Homage To The Square (Memento), 1962 and Study For Homage To The Square (Yes), 1971. 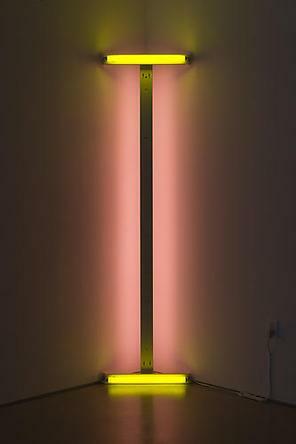 The four exquisite light works on view by American artist Dan Flavin range from his first fluorescent pieces of the 1960s to those of the mid 1990's. 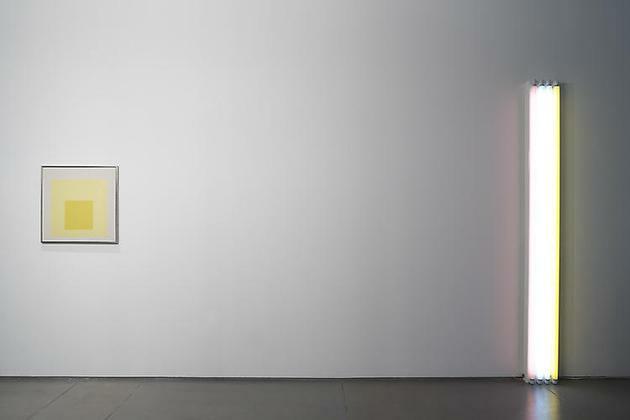 Among these works are Untitled (To Mr. & Mrs. Thomas Inch), 1964, constructed of four eight-foot fluorescent tubes of pink, daylight, cool white, and yellow; and Untitled (To Rainer) 2, 1987, comprised of two five-foot, cool white, fluorescent tubes and one five-foot, warm white, fluorescent tube. 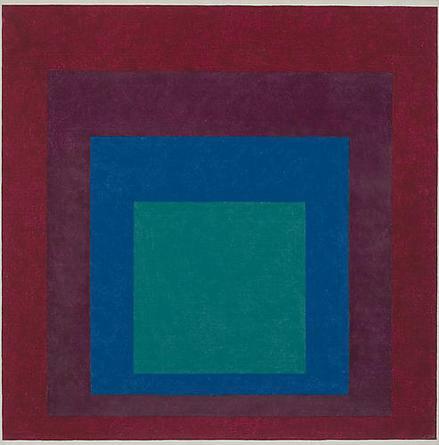 Josef Albers (1888-1976), studied art in Essen and Munich before entering the Bauhaus in Weimar in 1920 where he later secured a teaching position. 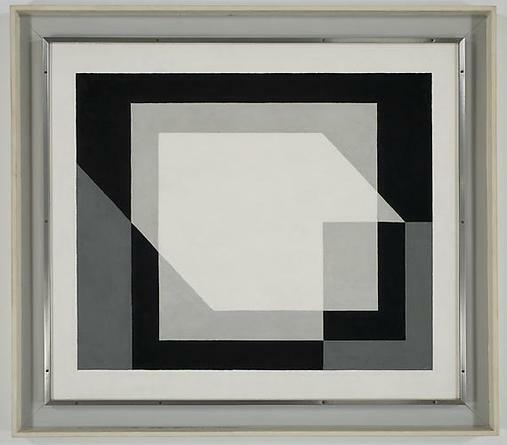 After the closing of the Bauhaus, Albers immigrated to the United States where he became a key faculty member at Black Mountain College until 1949. In 1950 he became the head of the Department of Design at Yale University. 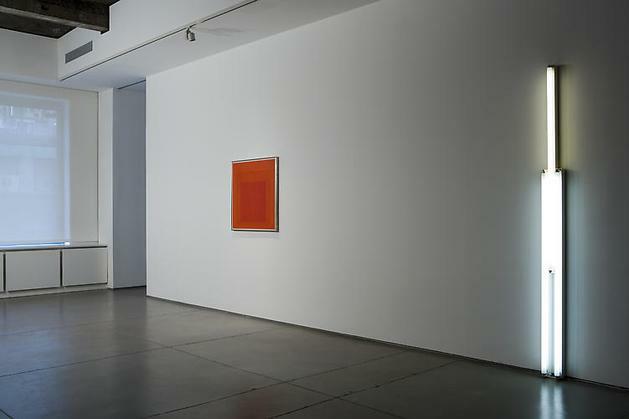 Albers had his first solo exhibition in 1936 at J. 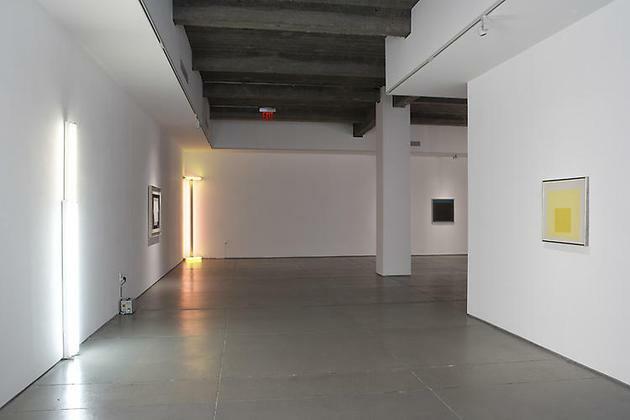 B. Neumann's New Art Circle in New York. 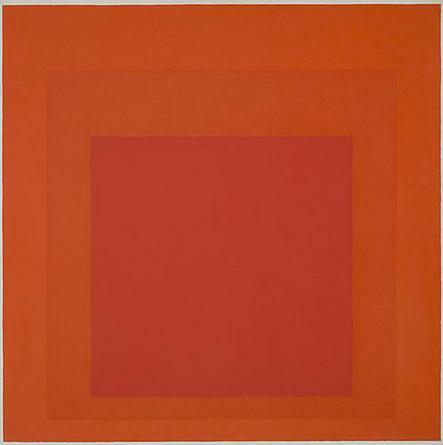 In 1949, Albers began his Homage to the Square series. In 1971 he was the first living artist to have a retrospective exhibition at the Metropolitan Museum of Art, New York. Dan Flavin (1933-1996) was born in Jamaica, New York and studied at the Hans Hoffman School of Art and Columbia University, among others. 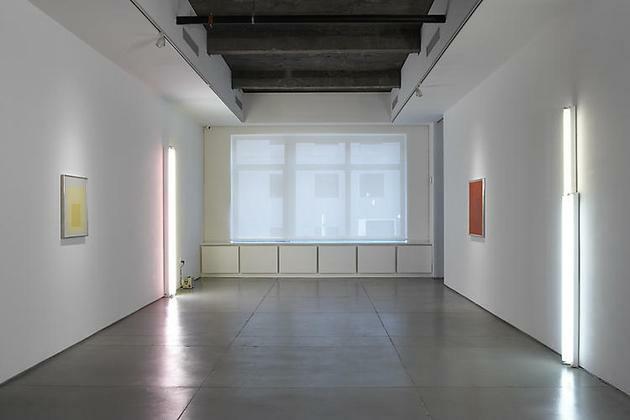 1961 marked his first solo exhibition at the Judson Gallery in New York and in 1963 he mounted Icons, his first exhibition of fluorescent light works. By 1969, he started making room-size proposals and had his first major museum solo exhibition at the National Gallery of Canada, Ottawa, later traveling to the Jewish Museum in New York. 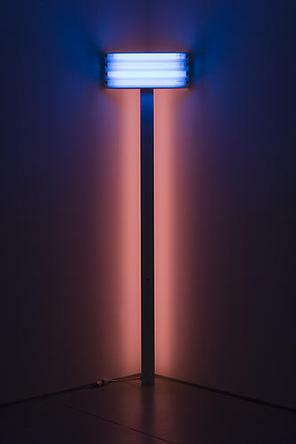 Dan Flavin: A Retrospective was recently organized by the Dia Art Foundation in association with the National Gallery of Art. For more information and images please contact Lauren Cicione at 646.336.7183.